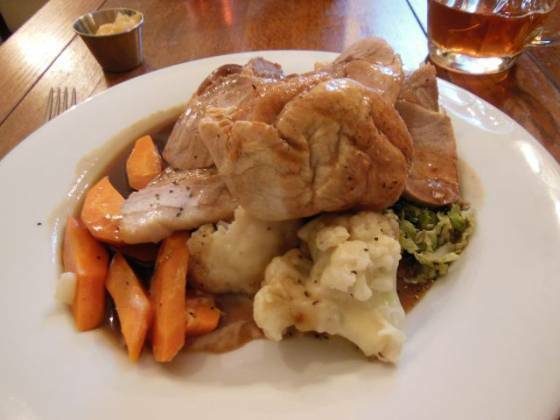 With our Sunday lunch in West Wickham review recently, I wanted to try another in the local area. 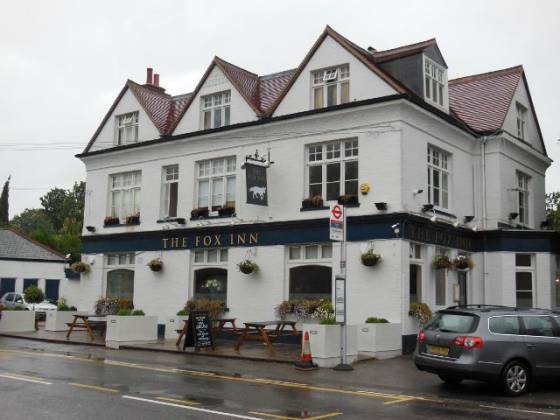 I finally decided on a Sunday roast at The Fox in Keston, part of Bromley, Kent. I gave them a call and booked lunch for 4 (we were reviewing with my grandparents – Grandmother AKA GM, Granddad AKA GD). We parked up in the car park and walked through the back way into The Fox. There was a bar area with the F1 on a large TV – this part was completely rammed with people. Walking further on, we entered the restaurant area, and were met at the bar by a server. We were shown to our table over the other side, which I was very pleased about – the bar area was very loud. The decor of the venue was good – cream coloured walls, chandelier-type light fittings, and hanging pictures of old local scenes. The wallpaper was most interesting – old black and white photographs with a silver finish. Something fun to talk about whilst eating… There were also a couple of sofas over on the other side of the restaurant, with a large TV showing the F1. We were handed menus as we sat down, and were asked about drinks. A pint of IPA for GD (£3.20), GM went for a berry cider (£4.70), Claire on the soda water (£0.00) and I had pint of Fosters (£3.80). 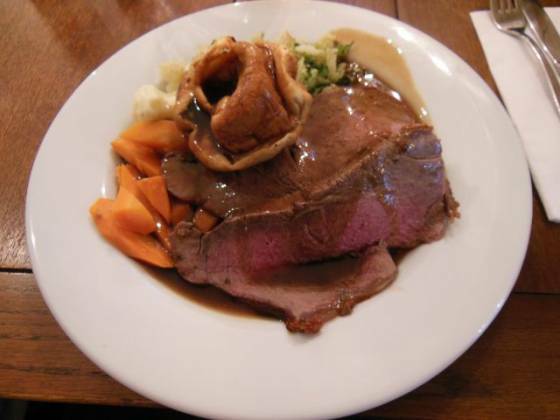 Our lunch orders were taken soon afterwards (GM – Roast Lamb, GD – Roast Pork, Claire – Roast Turkey, Me – Roast Beef, requested rare as I was told this was possible, although Claire asked for this originally and wanted it cooked well done). Whilst waiting for our lunch to arrive, someone in the restaurant must have ordered a couple of coffees as the machine behind us was extremely loud and meant we were unable to talk for at least a couple of minutes. The acoustics of the venue was very poor (or good, depending on your view) – we found it quite hard to hear each other at times, which was off putting. Our lunch order arrived after 25 minutes, with the server bringing over 3 roast beefs… which were promptly taken away again as they were wrong (and I don’t believe she ever found if anyone ordered them). 20 minutes later, our food finally arrived. We each had two thick slices of meat, roast potatoes, Yorkshire pudding, cauliflower cheese, carrots and shredded savoy cabbage. All this was covered in nice, thick gravy. Tucking in, the beef was cooked more medium-well instead of my request for rare, which was a disappointment. It was still good though, and a lot of it. Everyone else were happy with their meat; I believe GD had some crackling and Claire had stuffing. There was no seasoning with the meat, so it did taste a bit bland. I had 4 small roast potatoes, one was very crunchy without much potato inside. 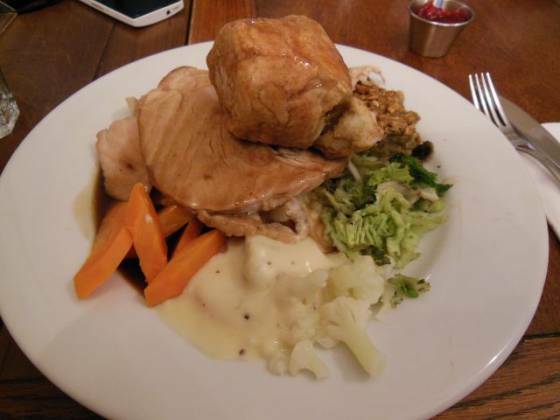 The others were not very good; looking at everyone else’s though, they had two very large and well cooked roasties. So, it just seemed one of those things. The cauliflower cheese was a nice surprise. I would have preferred burnt cheese on top as it just had creamy sauce (saying this though, GM prefers it the way they served it so just personal taste) but I am always pleased when this is served. The carrots tasted fresh with a pleasingly slight bite and the savoy cabbage was also enjoyable. The Yorkshire pudding was a bit on a non-event, it was not large and fluffy (ie how I like them), more quite flat and deflated – I believe it was home-made though. The gravy was excellent, with a good flavour coming through and also more than enough (GD actually commented that I was wasting gravy by leaving it! :-)). The desserts were served much quicker than the Sunday roast, coming out only in a couple of minutes. We each had quite a large slice of desserts, all looking very similar in fact. I would have expected the banoffee pie to be different to the cheesecake, but actually they seemed to almost be the same dessert. 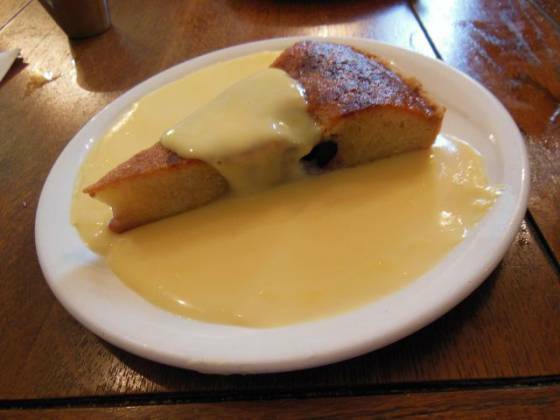 The weird thing was that GM’s pie was also served on a plate, with custard. It was almost overflowing! 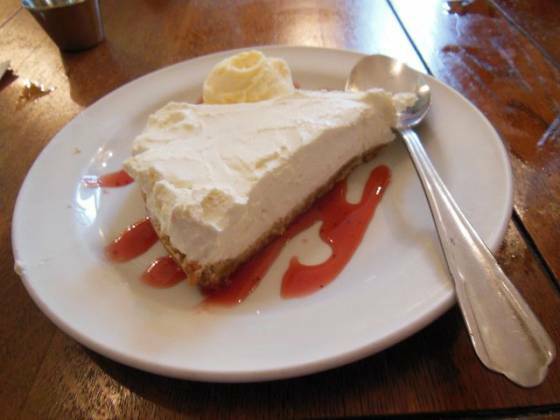 I appreciated the scoop of icecream with my banoffee pie, as well as the fruity sauce. 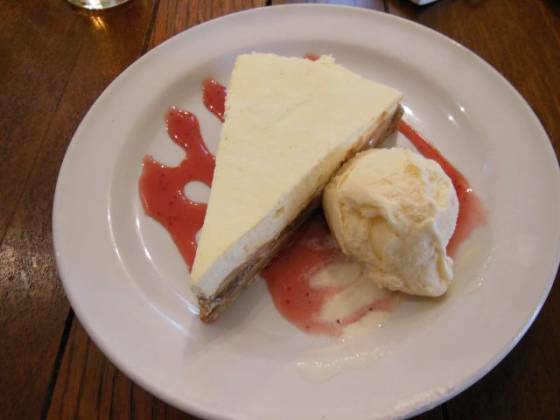 We all agreed the desserts tasted good and were sizeable portions, which are the main things. A mixed bag with this conclusion. With the pricing being at the high end for the area (between £11.50 and £12.95), I expected a high quality lunch, in a nice venue and good service. What we got was a nice lunch, a loud venue and slow service. 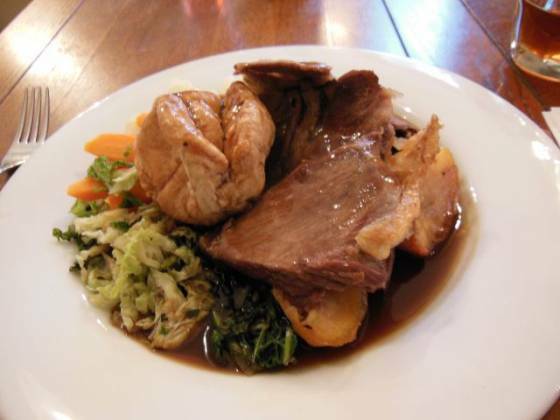 I was pleased with most of the Sunday roast, the Yorkshire pudding could have been better, as well as my roast potatoes. The meat tasted good quality, just a shame they didn’t season it. The coffee machine should be in the kitchen, or at least away from the bar area – this is a pub / restaurant, not a coffee shop (it irritates me in cafés too). The acoustics were in the venue terrible and I do not think it’s appropriate to have a TV in the restaurant area – this is not a venue to have a relaxing lunch with family, in my opinion. Also, something that really annoyed me, the dessert menu had a “10% discretionary service charge will be added to the bill”, whereas the main menu didn’t mention this at all. What would have happened if we had lunch without dessert, I wonder? So, whilst not everything was too my taste (nor my hearing), I recommend coming here for the sport, the busy ambience, interesting wallpaper, and good quality meat.